Did you pop open the battery cover to find a big corrosion mess? You can clean a device that has had a leaky battery. It isn't a difficult process as long as you follow the directions carefully. If the corrosion is found quickly enough, following the cleaning tips below should help you save the device from being permanently damaged. The first thing you should do upon finding a corroded battery in any electronic device is put on gloves and eye protection. This is important because potassium hydroxide, the substance leaking from the battery, causes irritation if it gets on your skin or in your eyes. Carefully remove the batteries with gloved hands and recycle properly. After the batteries are removed, you will need to clean the corrosion from the device in question. Do this with the cotton swabs or toothbrush dipped in vinegar or lemon juice. The acid from these will help dissolve the corrosion from the device. Scrub with the swab or toothbrush to remove as much corrosion as possible. Any remaining residue can be removed with baking soda and a tiny bit of water. Again, scrub with the cotton swab or old toothbrush. Take a damp swab and wipe away any left over baking soda (or other substances) that remain. Allow the device to dry completely before putting in new batteries. 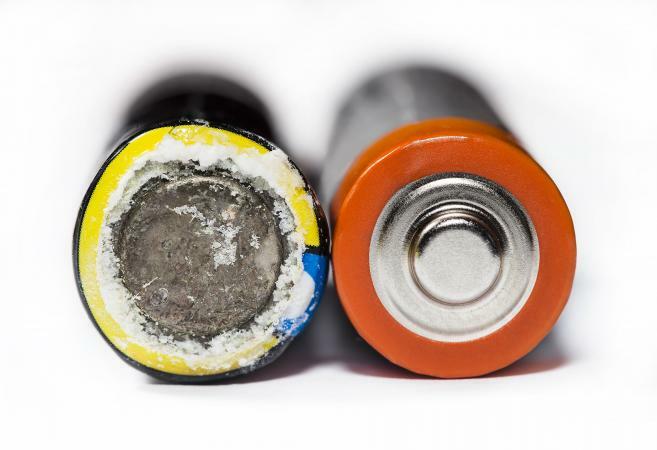 You can reduce the need to clean alkaline battery corrosion if you take special care of your batteries. If you plan to store the device for any period of time, remove the batteries. That way, if the batteries leak you won't have to worry about damage to the electronic device. If the device also has an AC adaptor and you are using it, remove the batteries while it is plugged in. Do not store your batteries anywhere that gets extreme (hot or cold) temperatures. Storing in the refrigerator will not prolong the life of your batteries. This will reduce the life of the battery and could cause it to leak. When you do put batteries in a device, make sure the batteries match. Do not put an old battery and a new battery together in the same device. Be sure they are the same brand as well. When you replace the batteries, clean the surface of the new battery as well as the connectors in the device with an eraser. This allows for the best possible contact. If your device is irreparably damaged from battery corrosion due to battery defect, often the battery manufacturer will replace the item or repair the damage for free. You will have to pay to send the device to the company. The potassium hydroxide that leaks from batteries is a corrosive material that is highly toxic. The caustic material can cause skin irritation and damage your eyes. It can also cause respiratory problems. Always take the following precautions when cleaning batteries. Avoid contact with your skin. Make sure to wear rubber or latex gloves. Keep your eyes safe by wearing safety glasses. If the potassium hydroxide makes contact with your skin, flush the area well with water.